Since the 1990s, Equatorial Guinea has become one of the largest oil producing countries in Sub-Saharan Africa, and it is now the richest country per capita in Africa. It ranks 43rd in the world for gross domestic product per capita. However, the oil revenue is distributed very unequally and most people see no benefit from the high GDP. the country ranks 144th on the UN’s 2014 Human Development Index. What this means is that Equatorial Guinea fails to convert a relatively high income into high life expectancy and formal education for its people. Equatorial Guinea – Why High Income but Low Human Development? For starters – Equatorial Guinea has been ‘blessed’ with a natural supply of oil and gas. However, the income doesn’t trickle down because of an autocratic government which controls the oil industry and uses the revenue to enrich itself and keep itself in power. The current president of Equatorial Guinea is Teodoro Obiang, he has been quite literally running the country for three decades. He has extensive powers, including naming and dismissing members of the cabinet, making laws by decree, negotiating and ratifying treaties and serving as commander in chief of the armed forces.The anti-corruption lobby Transparency International describes Obiang as one of the world’s “most kleptocratic” living autocrats and has put Equatorial Guinea in the top 12 of its list of most corrupt states. The advocacy group Global Witness has been lobbying the United States to act against Obiang’s son, Teodorin, who is vice-president and a government minister. It says there is credible evidence that he spent millions buying a Malibu mansion and private jet using corruptly acquired funds. During the three decades of his rule, Obiang has shown little tolerance for opposition. While the country is nominally a democracy, elections have generally been considered a sham. According to Human Rights Watch, the dictatorship of President Obiang has used an oil boom to entrench and enrich itself further at the expense of the country’s people. Without the help of international oil corporations, it’s unlikely that Equatorial Guinea would have been able to drill for oil – think about it, drilling for oil requires heavy industry and lots of investment. Exon Mobile, the USA’s biggest oil company, has been operating in Equatorial Guinea since the mid 1990s and controls a 75% stake in Equatorial Guinea’s most productive oil field, which produces 270 000 barrels of oil a day (the market value of oil is currently $50 a day, which means this one field returns a revenue of around $1.4 million a day, or around $400 million a year). NB the government (which basically means Obiang’s family) only controls a 5% stake of this particular field, but this tiny stake from this one oil field returns them something in the region of $300 000 a day, and there are many more oil fields. Despite his dismal human rights and corruption record, Obiang was recently invited (in 2014) to a U.S. African summit – along with a whole load of other human rights abusers on the continent. The general gist of the article is that the U.S. is tolerant of corrupt governments in Africa because if they don’t do business with them, then the Chinese will, there’s also the fact that they might be useful in combating Islamic extremism. This country case-study is also useful for illustrating how TNCs are not interested in promoting social development in other parts of the world. (1) You’ll notice from the graph above that Cuba is a good example of a country which has a relatively high human development compared to its GNI per capita, more on that later. America – A Less Developed Country? The United States ranks either at the top, or very near the top on several of the main development indicators used by the World Bank and the United Nations, but if you look more closely you find that the United States might not be so ‘developed’ after all. The U.S.A. – You don’t need to dig too deep to find squalor beneath the surface, in fact you don’t really need to dig at all! This post starts out by exploring the seemingly positive indicators which suggest that the United States is one the most developed nations on earth, before looking at some other statistics and evidence which reveal the darker side of life in the United States, outlining some of the many areas where the U.S.A. looks very underdeveloped, despite its huge wealth and income. The U.S. ranks very high up the league tables for many economic indicators of development, such as Gross National Income, Gross National Product, and for total wealth. It also scores very highly in the United Nations Human Development Index which measure income, education and life-expectancy. The United States is the wealthiest country on earth by a long way, at least measured in terms of Nominal Gross National Income, where it’s GNI of $17 trillion is a long way ahead of second place China’s $10 trillion (2014 figures). GNI basically measures the value of goods produced in a country + wages earned abroad (fuller definition here). The chart below shows rankings by GDP (Gross Domestic Product) which measures economic output in a slightly different way to GNI, but gives very similar rankings to the vast majority of countries when compared to the GNI rankings (see link above for the differences between GDP and GNI). In terms of GNI per capita (GNI per person), the United States is also very near the top of the league table, coming 6th if we exclude the tax havens at the top, and the only country with a population over 200 million anywhere near the top. According to Credit Suisse’s ‘World Wealth Report 2015‘, we see the same story in terms of wealth, where the Unites States remains one of the few countries with very high levels of wealth. If we take a slightly more in-depth look at the development levels of the United States, then according to Human Development Index (2015 figures) which gives countries a score based on a combination of GNI per capita, the average levels of education and life expectancy, the USA is in the highest ‘very high human development’ category and it still ranks an impressive 8th (the U.K. is 14th), and as with GNI per capita is the only country with a huge population in the top 10. Despite its coming near the top of the league tables for many economic indicators, the U.S.A. comes much lower down many of the international league tables for social development, which suggests that the U.S.A. is failing to translate its enormous wealth and high levels of income into appropriate levels social development. According to the OECD, the USA was the third most unequal country in terms of income (2014 data). The most graphic way of displaying this is through the GINI coefficient. This ranks nations according to equality – A nation where every individual’s income is equal would have a gini index of 0. A nation where one individual gets all income, while everyone else gets nothing would have a gini index of 100. To put this in terms which might be slightly easier to understand: In the USA, the top 20% of income earners take home almost nine times as much as the bottom 20% of income earners. The graph below illustrates the increasing income inequalities in America – the share of national pre-tax income going to the top 1% has increased from around 13% to 21% (for only 1% of the population), whereas the share of income which goes to the bottom 50% has decreased from around 19% to 13%. In pre-tax income dollars, this means the top 1% earn an average of $1.3 million a year, while the bottom 50% of the American population earned an average of $16,000, which means that the top 1% earn 81 times the bottom 50%, compared to 1980 when it was only 27 times more. If we look at the distribution of wealth in America, rather than income, there is an even higher degree of inequality. According to Allianz’s new Global Wealth Report (2015) which includes not just salary, but also property and investments held by a family found that America’s wealth inequality is even more gaping its income inequality. The U.S. has $63.5 trillion, or 41.6% of the world’s private wealth (next to China with 10.5%, the U.K. is 4th with 5.6%), but the U.S. also has the largest wealth inequality gap of 55 countries studied, according to the report. Allianz calculated each country’s wealth Gini coefficient — a measure of inequality in which 0 is perfect equality and 100 would mean perfect inequality, or one person owning all the wealth. It found that the U.S. had the most wealth inequality, with a score of 80.56, showing the most concentration of overall wealth in the hands of the proportionately fewest people. These statistics on income and wealth inequality are one of the main reasons why I think it’s fair to argue that America is in some ways an underdeveloped country – because such unequal distribution of income and wealth means the people at the bottom are effectively marginalised and don’t benefit from all that wealth and income sloshing about – what we effectively have are pockets of people who don’t benefit from the economic growth (‘development’) which the country as a whole has enjoyed over the past decades. Some grim evidence for this lies in the fact that 30 million Americans still can’t afford health insurance (Fiscal Times 2016), with a further 20 million only benefiting from it because of Obamacare (which may be Trashed following Trump’s election), which totals 50 million, or about 20% of the population. If 50 million people lack sufficient money for health care, they sure as hell won’t have enough money to fully participate in the full-blown joys of consumerism which is so much part of American culture. So that’s 30 million (possibly soon to rise back up to 50 million) people within the United States, unable to access basic health care, just like in many poorer countries, which is pretty compelling evidence for labeling the United States ‘underdeveloped’. (NB if those 50 million people made up a country, it would be 28th most populated country on earth, out of 233). On top of this, the relatively poor in America also have to contend with everyone else’s wealth and income being conspicuously consumed and displayed around them – on the streets, but especially in the media (if they’re stupid enough to watch T.V, which is most people), which adds an aspect of indignity into just earning enough to get by. Kim Kardashian – making the rest of us feel even more worthless? Of course if you were to compare the richest 10% with the bottom 10% the multiplier effect would be even greater, and it’s this section of the population which will be most likely to experience the many problems that come with poverty and extreme relative deprivation – facing the insecurity of flexible working conditions, living on sink housing estates, the threat of homelessness, the worries of debt, and living in the midst of higher crime areas. Obviously related the above statistics, The Atlantic notes that the official US census data shows that ‘14.9 per cent of Americans, or almost 47 million people, falling below the poverty threshold of about $24,000 for the year.’ (2014 figures). HOWEVER, the supplemental data shows that the true figure is slightly higher – standing at 15.3%. In 2016, the USA ranked a dismal 53rd for Life Expectancy, and the USA is one of only very few countries with ‘very high’ human development where the average life expectancy of the population is below 80 (you can see this in the Human Development Index table above), and in fact, according to the table below, there are several countries which are nestled alongside the USA, such as Puerto Rico and Cuba, which are considerably poorer but do much better on this key indicator of human development. 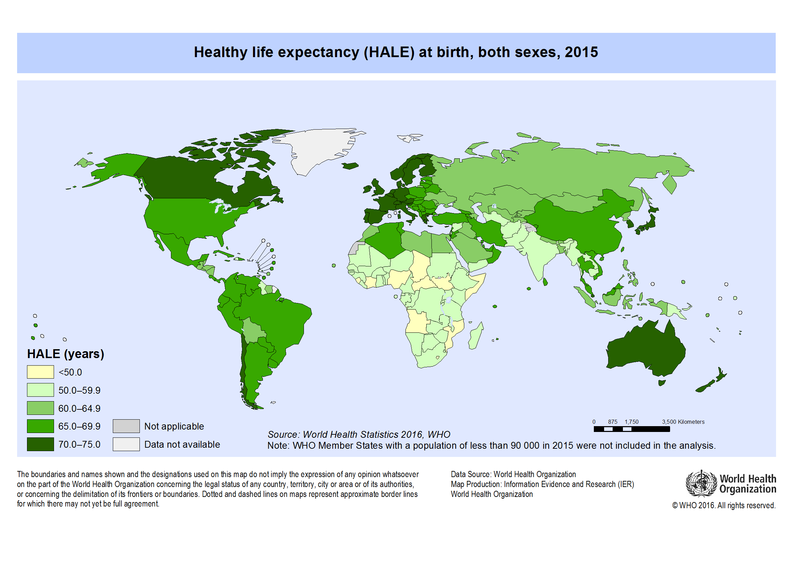 If you look at World Health Organisation data on healthy life expectancy, then the relative development levels of the United States look even worse. There is a marked contrast between the USA and Europe European countries, which have similar levels of GNI per capita and education to the USA, have healthy life expediencies of 70+, while the United State’s healthy life expectancy languishes in the 65-69 bracket below, alongside the much poorer South American countries and China. According to the Global Peace Index, America has witnessed the fourth largest decrease in peacefulness in last ten years, in terms of how far it’s regressed, it’s right next to Syria in the international league tables for the ten year decline in peacefulness. HOWEVER, the main contributing factor to America’s high violence rating is it’s continued high levels of expenditure on its military and heavy weaponry. Despite military expenditure declining in recent years, relative to other nations, the U.S. still spends a fortune on the machinery of violence. The United States are by far the largest nuclear power producer, with 33.2% of the world’s total, followed by France (17.1%) and Russia (7.0%). The United Kingdom’s production accounts for 2.9%. This also means that the United States is the largest producer of nuclear waste, including Plutonium, an essential ingredient in nuclear weapons.